He is not going to disband parliament for now. 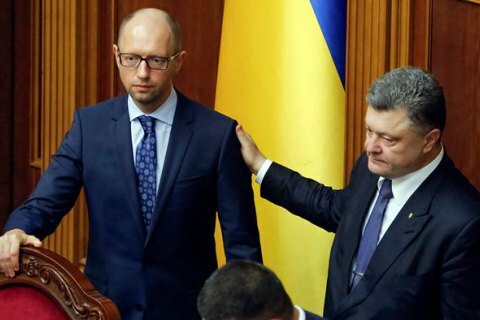 Ukrainian President Petro Poroshenko has said the Cabinet of Ministers has to undergo complete reformatting. "A total reformatting of the Cabinet of Ministers must happen on the basis of the existing coalition consisting of Solidarity, People's Front, Self-Help and Fatherland," he said in the address to the nation published on his official website. He added 70 per cent of Ukrainian voters want the government dismissed, which is "the indicator that is categorically unacceptable to ignore". According to Poroshenko, although Prosecutor-General Viktor Shokin launched reforms "which have been stalled by the internal opposition in the Prosecutor-General's Office for decades", he did not win the public trust. "I had a meeting and a comprehensive conversation with the prosecutor-general this morning. I asked Viktor Mykolayovych to tender his resignation," he said in the address. "The internal political war of all against all is what our northeastern neighbour dreams of. Therefore I took the floor and expressed my view of the way out of the crisis - to avoid the worst case scenario," Poroshenko said. He said it was not his duty but the right to have parliament disbanded, but he would "only exercise it in the extreme case which we simply cannot allow to happen." He said he was waiting for parliament to adopt "fast and and state-minded" decisions. The Cabinet of Ministers is reporting on its performance to parliament today.